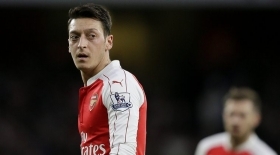 Serie A giants prepared to loan Mesut Ozil? Inter Milan are reportedly keen on signing Mesut Ozil on a temporary basis for the campaign, provided Arsenal agree to pay 50 percent of his wages. The Gunners are supposedly open to offloading the midfielder this month with manager Unai Emery not understood to consider him as a regular for the league duties. According to The Star, Emery is prepared to sanction a temporary exit for the German this week with the hope of securing a replacement before the transfer deadline. It is added that the Nerazzurri are leading the race to sign the former Real Madrid man, though any hope of a loan deal may depend on whether the Gunners are prepared to pay part of the midfielder's £350,000-a-week wages. Inter Milan's Ivan Perisic has been earmarked as a replacement for Ozil with the Croatian having recently handed in a transfer request to push through an initial loan move to the Gunners.